When searching for the best fare on a flight, it’s not uncommon for customers to peruse a third-party travel site like Expedia or Priceline and jump at the lowest number they see associated with a flight. But some United Airlines passengers say this tried-and-true method has resulted in the unexpected purchase of a no-frills Basic Economy ticket. For those unfamiliar, United’s Basic Economy fare is a no-frills flight experience, where customers don’t get to choose their seat in advance, are limited to one personal carry-on bag, can’t use the overhead bin space, and can’t make change their tickets. Business Insider reports that while United has taken steps during the checkout process on its own website to warn customers of what they’re getting into with Basic Economy, other sites haven’t. As a result, some customers tell Business Insider they’ve accidentally purchased Basic Economy tickets when they didn’t mean to. @united I've booked 40 flights on U thru @Expedia 1st time I've rec'd email about new basic economy. Last flight I'll book on Utd or Exp!! Thanks but I have no idea if I have basic economy or regular economy. I booked on expedia. Can someone help me figure this out? 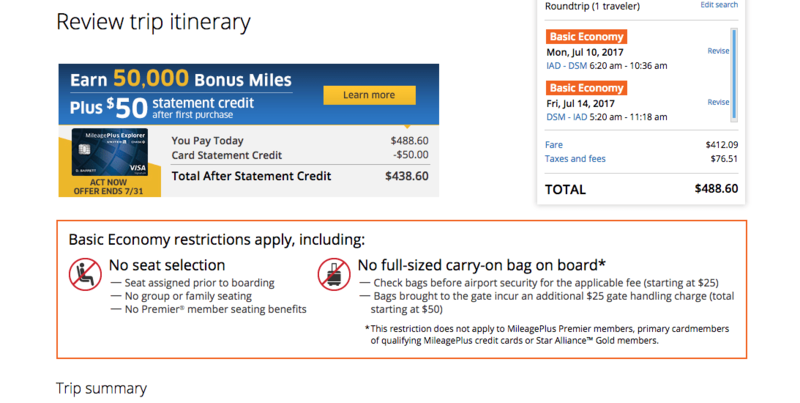 While a rep for United tells Business Insider that it works with third-party sites to ensure fare restrictions are clearly marked, searches for flights on United, Expedia, and Priceline show a few stark differences in the description of Basic Economy fares. When the customer selects Basic Economy they are greeted with a pop-up describing what is included (and what’s not) with the fare. To ensure customers are aware of the fare limitations, they must acknowledge the fare by checking the box “Basic Economy works for me” before proceeding. After selecting and approving the Basic Economy flight choice, customers are greeted with yet another warning on restrictions at the “Review Trip Itinerary” page. These warnings, however, are not the same on third-party sites. 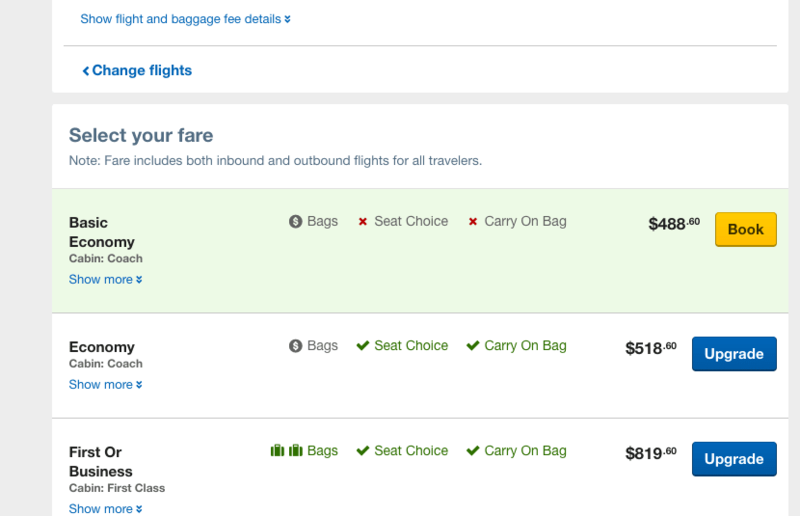 The same search completed on Expedia resulted in fewer descriptions of Basic Fare or warnings as to what is included with the ticket. Search results for flights include a small notation that they are Basic Economy, and clicking on that notation results in a small box with the short description of the fare. It’s not until a customer actually chooses the flight and is taken to the trip review site that Expedia fully explains what is included in the fare on the “Important Flight Information” side bar. 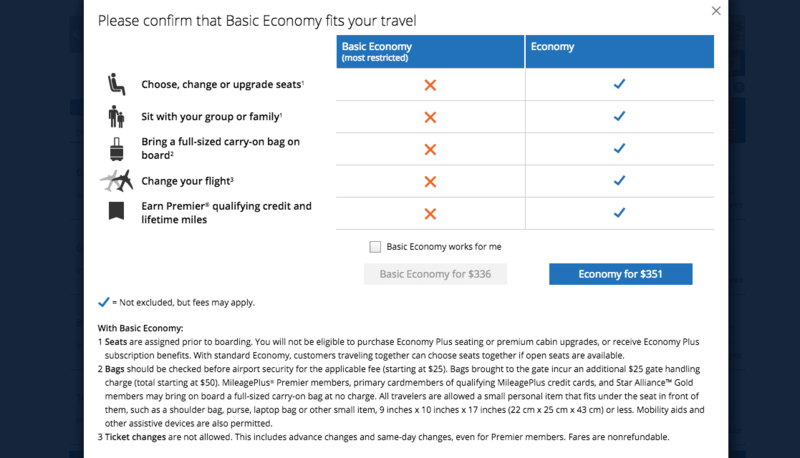 This same page offers customers the option to upgrade their flight to regular economy or another class. These options show what is included in the fare. 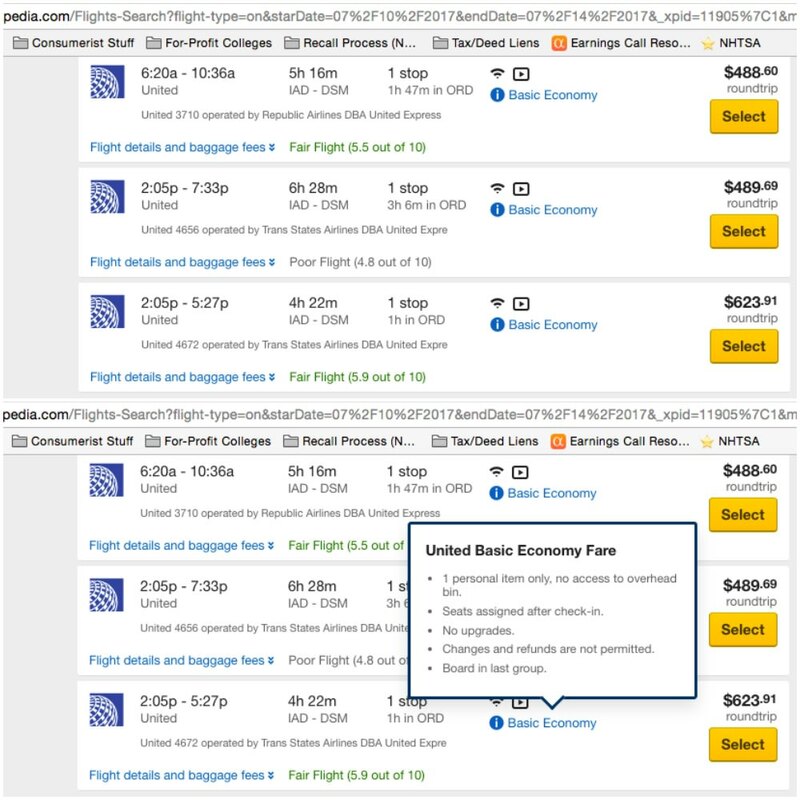 A rep for Expedia tells Business Insider that the company makes it clear what is included in a Basic Economy fare, and that customers can see more about the restrictions by clicking “Show More” under the search results. Orbitz, which is owned by Expedia, follows a similar process, noting in the search results that customers are looking at a Basic Economy fare. When passengers click on the fare notation, they see a pop-up with a short list of restrictions. Again, selecting the fare and proceeding to the review page results in longer list of restrictions. 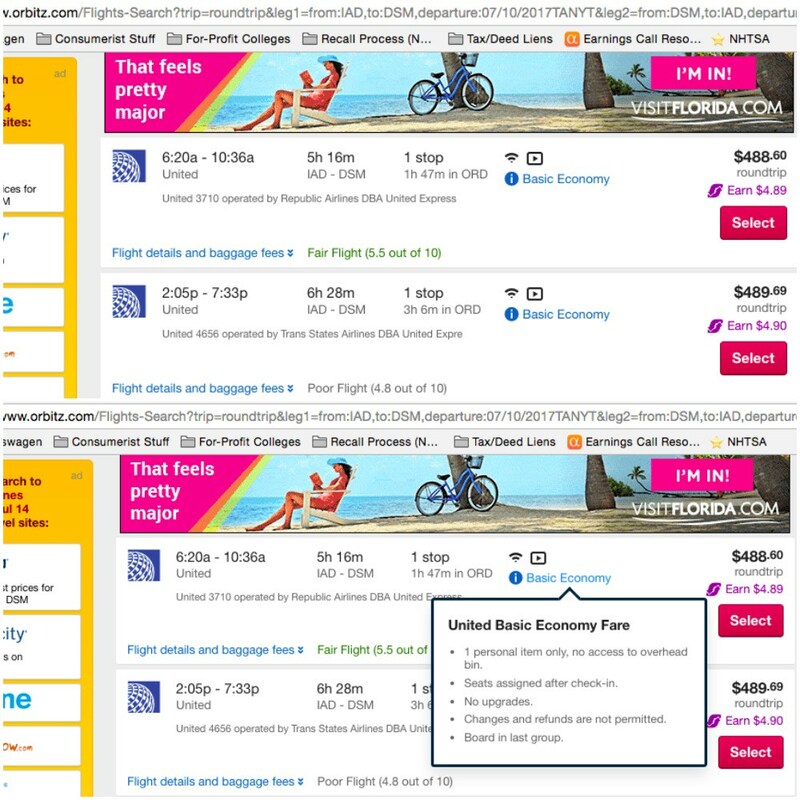 The process is similar on Priceline, however, the first search page does not include any mention that a fare listed may be Basic Economy. 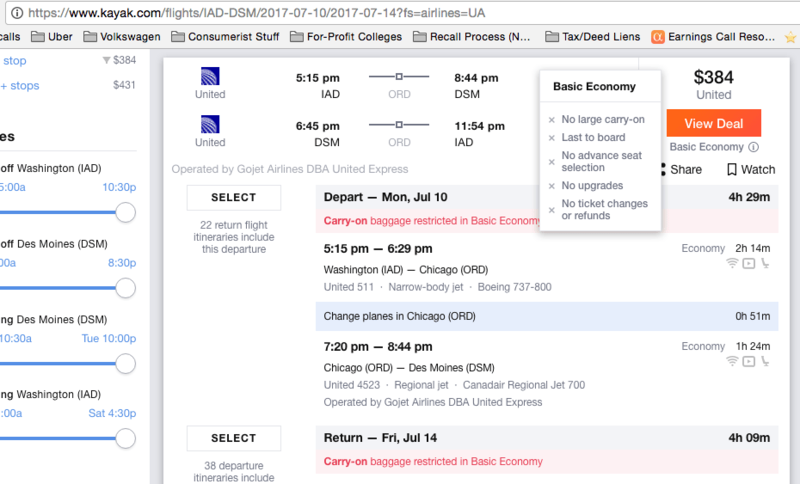 Once a traveler clicks on a fare, the site displays a pop-up of the flight details, with a small highlighted notation that the flight is, in fact, Basic Economy. Below this, on the same pop-up, Priceline provide a short detailed list of what is included in the Basic Economy fare. Proceeding to the checkout process, there is not another mention of the fare restrictions. Consumerist has reached out to Priceline for more information on how it chooses to mark and warn customers of basic fare restrictions. However, the biggest difference between booking with Kayak and other third-party sites is that once a customer chooses a flight, they are taken to United’s website to complete the purchase. There they are greeted with the same disclaimer as mentioned in the United section.